Four is fine but five is even better. For the fifth time in seven years, the High School Inc. Culinary Arts and Hospitality Academy team at Valley High School in Santa Ana will represent Orange County and California in a national High School Inc. cooking competition in Washington, D.C., designed to champion funding for school nutrition. Teams from Valley High School won the national championship each of the previous four years. 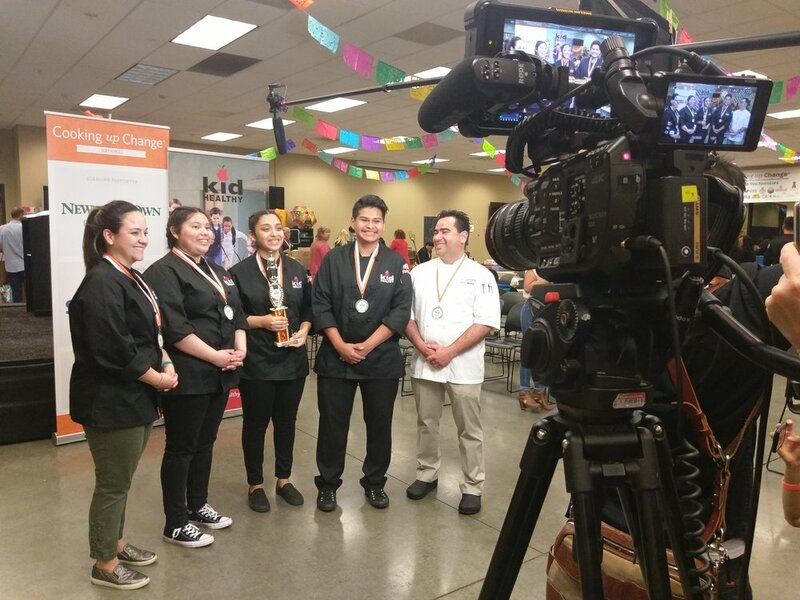 Three current Valley High School students – Wendy Castanon, Miguel Hernandez and Fernanda Nevares – will compete in the “Cooking Up Change National Finals” on June 11 in Washington, D.C., after capturing the regional competition April 26, 2018, at Northgate Gonzalez Market Headquarters in Anaheim, Calif. In addition to finishing first, the three-student Valley High School team won the 'People's Choice' for favorite after school snack. A partnership between the Santa Ana Unified School District, Santa Ana Chamber of Commerce and the High School Inc. Foundation Board, High School Inc. is committed to empowering youth and strengthening communities through education and business partnerships. The High School Inc. culinary team at Valley High School was established in 2007. Under rules of the regional competition, each student team created an original, three-course lunch following the standards of school food service professionals, including the use of available ingredients and a per-lunch budget of $1.40. Entries were judged on creativity, taste and nutrition. While in Washington, D.C., the students will meet their Congressional and local representatives to share their views on funding for school lunches. Located in Santa Ana’s Valley/Adams neighborhood, Valley High School celebrates its 60th anniversary in 2019. High School Inc. is a partnership between the Santa Ana Unified School District, the Santa Ana Chamber of Commerce, and the High School Inc. Foundation Board. Through this collaborative effort, HSI is committed to empowering youth and strengthening communities through education and business partnerships. Currently, there are six High School Inc. Academies at Valley High school in Santa Ana, Calif. The CHANGE academies include: Culinary Arts and Hospitality; Healthcare; Automotive, Transportation and Logistics; New Media; Global Business; and Engineering, Manufacturing and Construction. HSI Academy teachers at Valley High School work side-by-side and in strong collaboration with business partners and mentors to help students uncover their college and career interests, and develop plans to help them reach post-graduation goals. HSI Academy students are graduating at an accelerated rate, and receiving a higher percentage of internships. Students are also reporting more confidence and clarity in college and career goals, and businesses are reporting increased productivity. If you are inspired by High School Inc. at Valley High School and would like more information regarding our award-winning CHANGE Academies, please contact Mary Tran, Executive Director, at mary@highschoolinc.info.